A-Frame’s Aloha Relaunch | JR Ortiz | Foodie. Writer. Melomane. Geek. When I first found out that Roy Choi and Johnny Yoo were going to revamp A-Frame as a Hawaiian concept, I wasn’t sure what to expect. I was perfectly happy with the amazing ribs on the old menu; and that churro with the malted chocolate milk and vanilla ice cream is one of the few desserts that I actually look forward to at any restaurant. In fact, I, along with my best friend, made it a point to make it to A-Frame before they scrapped the old menu and enjoy the classics one last time. We ended up being the final ticket for the picnic menu. It was a bitter but delicious goodbye. A few days later however, I came across this picture on Choi’s Instagram with the ribs and the churro dessert circles, along with a few new dishes planned for the Hawaiian menu. Could this mean that those dishes would make it to the new menu? My buddy got us a late reservation for the reopening on Friday the 13th of all days. Walking in, there isn’t much that has changed. A few surf boards, a couple of drawings on the wood panel walls, but mostly it’s still A-Frame. We were seated and handed the new menus. Low and behold, the ribs and churro were there! The popcorn also made the cut which I was also glad to see. As much as I wanted to order the ribs, I wanted to make sure I tried as many of the new dishes as possible. Still, it was a relief to see those delicious items stick around. The first dish we received was the Eight Legged Duck — a baby octopus salad with crispy rice cubes and bits of seared foie gras. This was my first time having foie in California since the ban was lifted, and oh how I had missed it. Needless to say, the foie stole the show on this dish, but the octopus combined with the rice offered not only a great flavor combination, but perfect contrasting textures. There was a slight hint of spiciness which built up after each bite but nothing crazy. A solid starter. 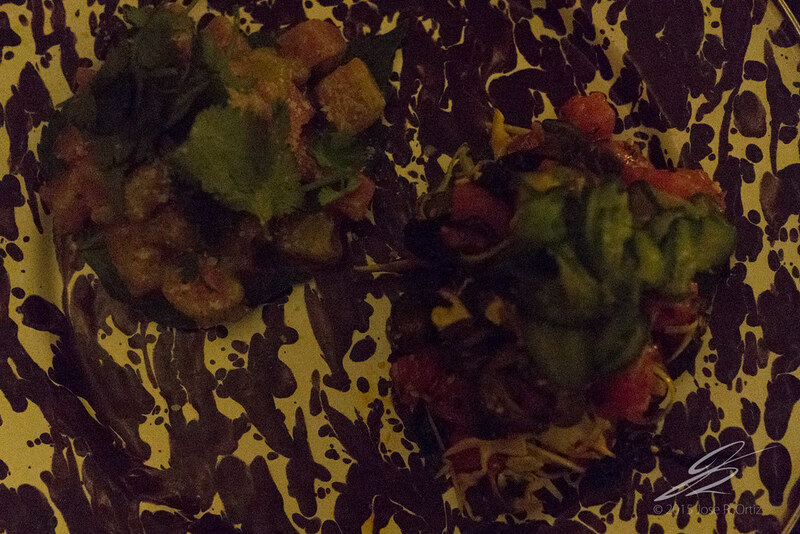 Next up was the Poke sampler which we were really looking forward to. This was my first time having Poke, but my friend has been telling me about since his trip to Hawaii over a year ago. The sampler comes with two different preparations. One was a salsa verde style mix. It was very simple but packed quite a bit of flavor. 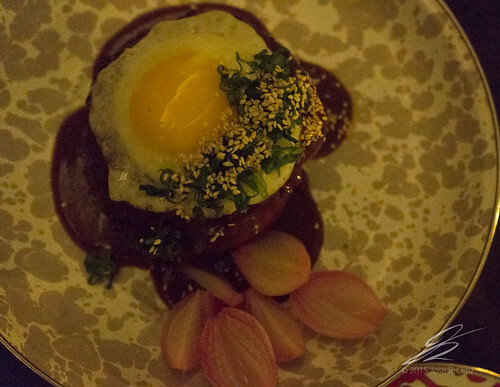 The acidity of tomatillo was very much present with just enough spiciness to make it interesting. The other was a Korean inspired Poke with a kind of kimchi slaw, topped with pickled cucumber. The flavor was really good and definitely tasted like something that would be served alongside Korean BBQ, but the tuna was lost in those strong flavors. I definitely preferred the salsa verde Poke, but I wasn’t impressed by either one if I’m being honest. My Poke loving friend felt the same way. It wasn’t bad, but it’s not something that left me wanting more. What I did want more of was the Loco Moco. The core ingredients are all there, but the curry gravy is what really made this dish shine. After mashing and mixing it all up, the curry was present in every single bite. I can’t compare the flavor to anything. It was unique in the most delicious way possible. The hamburger was good all on its own as well, but that curry gravy made it great. The pickled onions offered balance to the dish, and the ingredients came together beautifully. Definitely one of the standouts on the new menu. 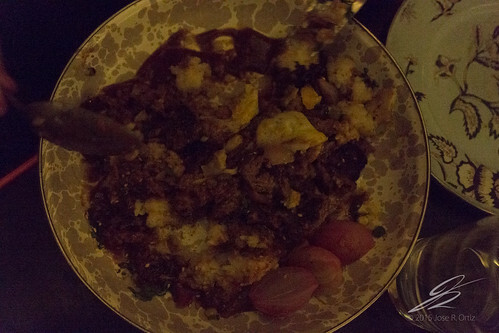 Another standout that was so good I didn’t even get a chance to take a picture of, was the Chili Rice Cakes. We order this on our server’s recommendation, and boy was she dead on with this one. At first glance, it looks like a standard bowl of chili. There’s some cheese sprinkled on top with a dollop of sour cream which is all mixed in before eating. But once you start digging in, you find these wonderful nuggets of crisp rice cubes which have absorbed the richness of the chili they have been sitting in. I think I could have finished the entire bowl by myself if my friend hand’t been going at it as quickly as I was. The dish also has pineapple in it, but I was either inhaling it so fast that I didn’t notice it, or I just didn’t happen to get any pieces to notice it. Regardless, this is another new favorite for me. For our next dish, we went back to the apps with an order of Hush Poippies. Little balls of taro, potato, and cheese with a sweet chili sauce, topped off with Parmesan and chives. They are served extremely hot, which might be a good thing since it prevented me from popping them in my mouth one after another. The flavor is subtle; nothing too exciting but a solid appetizer to share with the table. 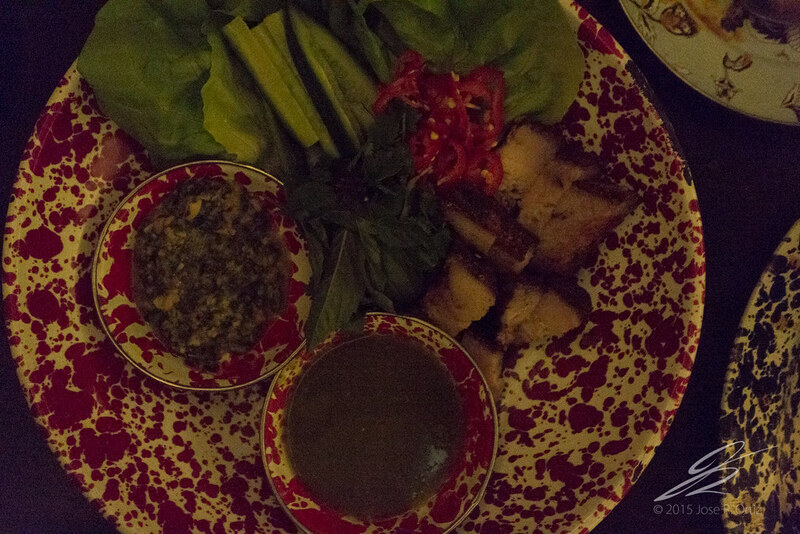 After that little pit-stop, we went back to a large plate with the Pork Belly Lechon which was served with lettuce leaves, fresh chillis, persian cucumber sticks, and cilantro. 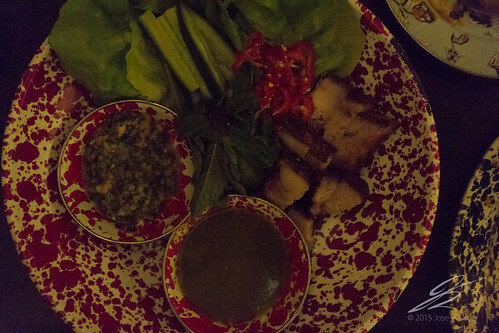 Once the lettuce wrap is constructed, it can be topped off with a chimichuri and green Sriracha. The pork belly is insanely tender and will literally melt in your mouth. Of course, the fattiness of the belly has a lot to do with that, but the freshness of the herbs and lettuce balance that perfectly. The Sriracha was surprisingly not spicy at all. It had more of a citrus flavor to it than it did spice but still good. It was a very rich dish and though it was good, I think one little wrap is enough to feel satisfied. The second one felt a little heavy and overwhelming. A great plate to share with a large group, but not something I’d get if I was only eating with one other person. The only real miss of the night was the Saimin Says. I had never had Saimin before, but what caught my eye on the dish was the egg. I’m a sucker for a decadent egg. The bowl came out and it was filled almost to the top with broth, and the only other thing that was visible was the floating egg. The noodles and sausage was submerged in the dark broth. On the side was a fish skewer which looked perfectly seared. We dug in, eager to try the noodles. Unfortunately, the broth was so salty, that we simply could not enjoy it. The fish which was served outside of the bowl, was the only salvageable item of the dish. The sausage that came in the broth, has a nice flavor to it, but even that had soaked up too much of the broth’s sodium avalanche. Our server was nice enough to remove it from our bill. I’m not sure if we just got a bad batch of broth or that’s simply how it is served. It’s hard to believe that it was supposed to be that salted though. As far as desserts go, the classic Chu Don’t Know Mang churro was just too good for me to pass up. Even though it has been less than a week since I had it, I couldn’t resist getting it again. My friend however, did opt for one of the new treats: butter mochi cake. It was a very simple dessert, consisting mostly of mochi with some candied orange rinds and slices of orange on top. The mochi was warm and had a wonderful texture to it. Worth checking out, but nothing beats that churro in my book. Aside from that one miss, everything we had was solid with more than a couple of standouts. 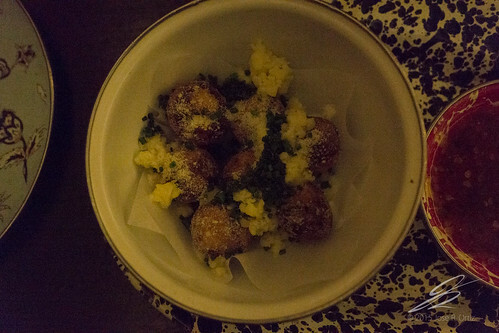 With a party of three, we still left quite a bit of the menu to be explored. Based on the dished we had though, A-Frame’s new concept is a winner. Extremely savory dishes with enough variety to satisfy all eaters. On top of that, they’ve kept some of the favorites from picnic which definitely made me happy, and I’m sure plenty others as well. If you liked A-Frame’s previous incarnation, there is no doubt you will love Aloha.